At 4 quarts, this model is the smallest option in the Stay and Go range and is also the least expensive. The size might not be enough for a full family, especially if you’re making main meals or looking for leftovers. But, I’ve found that 4 quarts is a good size for one or two people. Plus, the small size would make the whole thing lighter if you were going to transport it. The slow cooker is a manual model, so you pick the temperature using the dial up the front. To secure the lid for this slow cooker you just need to apply two clips to the handles, which appears to be pretty easy. In addition to being slightly larger, this model has some small design differences, particularly the use of a knob for setting temperature rather than a dial. However, the system for locking the lid is identical and it’s likely that the model would also perform roughly the same. As you can probably imagine, the biggest difference between this slow cooker and the previous model is simply color. The idea isn’t unusual and you’ll often find that brands make multiple versions of their more popular options. The performance is going to be roughly the same regardless but this model does look good visually and is definitely more interesting than the standard silver slow cookers. This model is simply another color option of the one above. In this case, the color choice is ‘shimmer finish silver’. I personally think that the red actually looks better but I imagine that not everybody would agree. Plus, your preference may depend on the color of other items in your kitchen. At the time of writing, this purple option is the only one of these three non-standard colors that is actually in stock on Amazon. The price here is actually really good because you would end up paying the same as for the smaller 4-quart option. Once again, the difference with this model is simply color. The slow cooker should perform the same as the other colors, especially as every other aspect of the design appears to be identical. When looking at this model, Amazon did also let me know that people tend to buy other purple kitchen items at the same time. So, I guess this one would suit if you’re going for a purple kitchen (because, why not?). 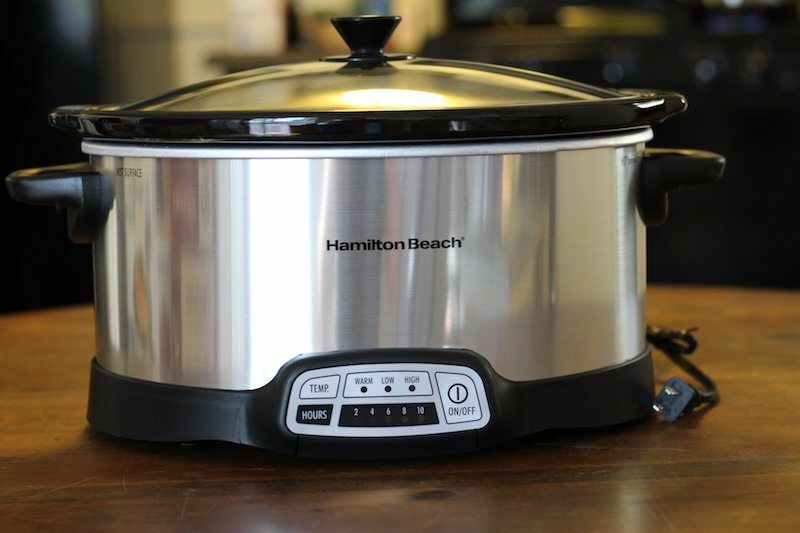 Unlike the previous models, this slow cooker is an automatic one. The key difference is the timer. With this, you get to set the time that you want your food to cook for. When that time has passed, the slow cooker automatically switches over to the keep warm mode. If you time your food well, an automatic slow cooker isn’t really necessary. However, they do reduce the chance that your food will burn. Additionally, this type of slow cooker is worth it if your schedule is unpredictable at all or if you are out for longer than your meal needs to cook. This particular model is a good option for the price, especially as it receives really good reviews on Amazon (4.4 stars across 277 reviews). Additionally, there’s a spoon that attaches to the handle, which is kind of cool. At 6 quarts, this slow cooker is larger than any of the others on the list so far and it is also more expensive than you might expect. The price is high even for a 6-quart slow cooker and may be related to the design. 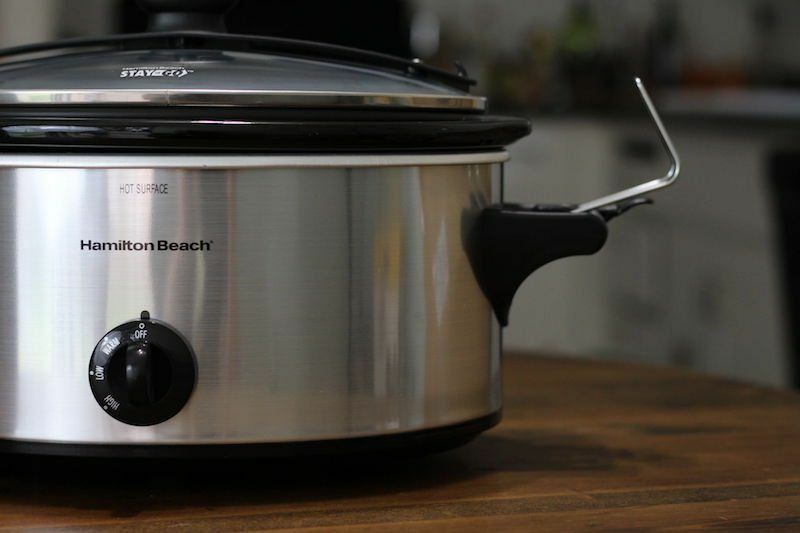 In particular, there are a few interesting things about the model, including a spoon slot on the handle, the spoon itself and a name tag holder on the side of the slow cooker. The handles also appear to be easier to use than some of the other models. It’s a little debatable whether the extra features are worth the price and that decision would mostly come down to personal preference. 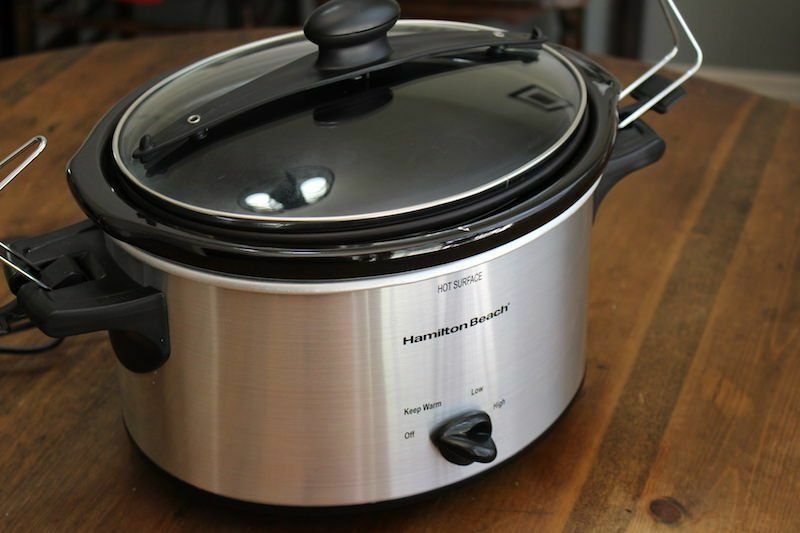 If you’re looking for an inexpensive 6-quart slow cooker, then this model is perfect. The functions here are the same as the other manual slow cookers in this list and even the overall design should be pretty familiar. Nevertheless, it’s hard to go wrong with a price this cheap for a 6-quart slow cooker, especially when this one receives so many positive reviews on Amazon. While the model may not be as visually interesting as the previous one, that doesn’t really matter when it comes to the quality of your food. This white model is another inexpensive option. The main difference here is just the color, as the handles and the slow cooker itself are different colors than with the previous model. In terms of reviews, this model does also get a high average rating on Amazon (4.4 stars). Now, there are fewer reviews for this slow cooker than the previous one. However, I’d guess that the pattern is simply because this color is less popular than the silver and black option. This model is the first example that uses the alternative method of sealing for the Stay and Go range. This time, the lid connected to a hinged arm that clips in place. This system does look a little better and means you can’t simply lose the clips you need, like you could with the previous style. Beyond the sealing aspect, this model is fairly similar to the others and you have a dial that you can use to pick the specific temperature setting that you want. The one other thing to consider is the price. This model is a bit more expensive than the previous examples but the difference isn’t substantial. It may also be worth paying the little bit extra for the different style of lid locking. Even though the picture isn’t as good, this model is the same size as the previous one and the only significant difference is the color. 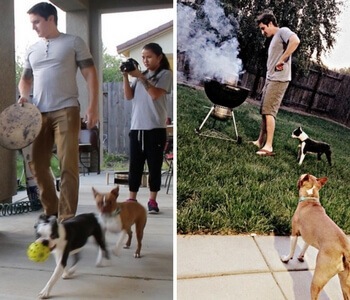 Instead of being silver and black, this slow cooker has football fields instead. While that pattern might not be the most suitable for a kitchen, it’s easy to see how it would be appealing at parties. This is another example of basically the same product, just with a different pattern. In this case, the pattern probably isn’t designed to be anything specific but it is more interesting than just a plain silver slow cooker. I mentioned programmable slow cookers before and this is another example, this time in the 6-quart size. The design here is actually a little unusual because you can only set the time in 2-hour increments, from 2 hours up to 10 hours. Those settings are probably fine for most recipes but you’re likely to find some that don’t evenly fit into those 2-hour slots. If so, you would have to tweak the recipe or the timing. 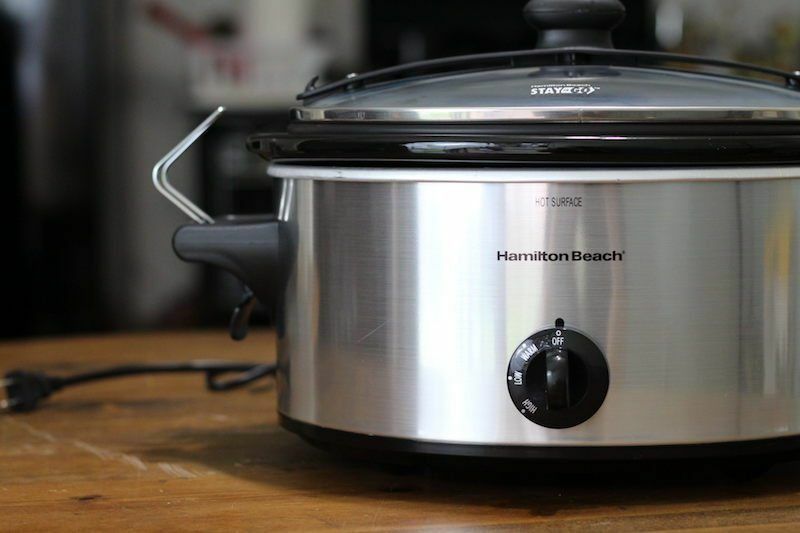 The programmable component of this slow cooker is the same as the previous one, where you have the 2-hour increments in time. However, the rest of the design is a bit different, especially in terms of the handles and the locking mechanism. Because the prices of the two models are so similar, you could basically choose based on the type of locking you prefer. As you can probably guess, this model is simply a slightly larger version of the 6-quart manual slow cooker. The basic design is identical and this also uses the hinged locking mechanism. Like the 6-quart version, this model gets decent ratings on Amazon and seems to be fairly popular. This final model is fairly predictable also, as it is basically a larger version of the previous programmable slow cookers. Again, there are the 2-hour increments in timing. While those may not be ideal, they probably aren’t an issue for most recipes. The lid locking mechanism is a little unusual for this model. Amazon doesn’t actually provide the Stay or Go lid as an option for this size, although there is a Lid Latch strap that can be used instead. That approach isn’t as powerful and there’s no explanation for why. Still, even with the more basic lid sealing, this slow cooker is a good one and scores well on Amazon.